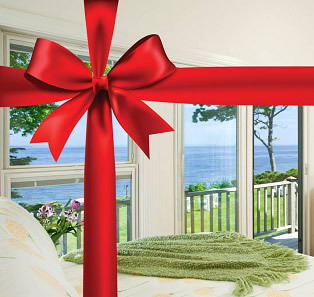 Let the Captain Jefferds Inn be your very special place in spectacular Kennebunkport, Maine. 10 of our warm and inviting bed & breakfast rooms are located in the beautifully preserved 1804 sea captain's home, while another 6 are located in the attached carriage house. All rooms have private baths and air conditioning. From the moment you enter our B&B, you will experience charm, comfort, and exceptional hospitality provided by the innkeepers and their dedicated staff. From the Captain Jefferds Inn, it’s just a quick stroll to Dock Square, Kennebunkport’s town center. Each morning, we offer a full breakfast prepared fresh daily in our kitchens. Specialties include: Baked eggs Florentine, Apricot-stuffed French toast, and Baked Grapefruit Alaska. Each afternoon, guests are treated to a wonderful selection of specialty teas, home-baked cookies, cheeses and spreads, hot-mulled cider, or, in the summer months, freshly squeezed lemonade. Located about 90 minutes north of Boston’s Logan International Airport and 30 minutes south of Portland International Jetport, the Captain Jefferds Inn is easily accessible by either air or auto. If you’re looking for a romantic bed & breakfast, relaxing getaway, or an activity- and fun-filled vacation, Kennebunkport and the Captain Jefferds Inn Bed & Breakfast await you! Children Policies: The inn is appropriate for children over the age of 10 years. Pet Policies: Dogs are permitted with prior reservations in the carriage house rooms. Please see web site for fees and policies. Smoking Policies: Outside only please.